Mansfield Town are ready for a real battle at Northampton Town this Saturday as they try to keep hold of second place in League Two. 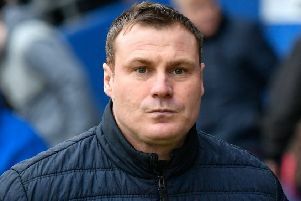 Former Stags boss Keith Curle has admitted he is getting his side to ‘play ugly’ right now and Mansfield manager David Flitcroft is ready to combat that. “Any League Two game at this time of the season can turn into a war of attrition and that’s something we have got - players who can deal with that,” he said. “We have a brilliant goals conceded column. We are resilient and we have warriors and an incredible energy in the team. Stags thrashed Northampton 4-0 at home in September which saw boss Dean Austin sacked. “Before we played them here you could tell something just wasn’t right,” said Flitcroft. Curle then took the reins and Flitcroft said it would appear he was now starting to plan for next season. “They knew they wanted a top professional in and that’s what they’ve done. Keith Curle’s work at Carlisle was pristine and professional,” he said. “They are in a transitional period, working out what it’s probably going to look like next season now they are safe and how to rebuild. He is the right man to take them to the next level where they want to go. “Keith has taken over a difficult situation. “You can see he almost wants to get to the end of the season and put a Keith Curle stamp on it. He added: “I think he is trying to understand what he has in the squad and what he needs to build out from that. Stags go into it on the back of two wins and Flitcroft said: “We are away from home and our last away performance was certainly the best we’ve had this season. “The lads believed in that and over the last two weeks their stats and energy is exceeding expectations, which I am delighted with our form going into it. Stags will be backed by an army of almost 1,500 fans at Sixfields and Flitcroft said: “Please stay patient and keep that belief. “At home on Saturday it got a little bit edgy – and these games will do as it is the business end of the season and players will make mistakes. We are all human. I will get things wrong. “We just need that unconditional support we’ve had all season and keep that energy. “Cambridge piled some pressure on us for the last 10 minutes and the support didn’t waver. It just kept driving us to keep the ball out the net and put blocks on. With Stags in second, they know their destiny is in their own hands, but the managed added: “I think our destiny has always been in our own hands from the start of the season. “The support we’ve had from the chairman and Carolyn, the board, the staff and supporters home and away has been phenomenal. “The backing has been promotion form. “It’s the people here that we are trying to do this for.